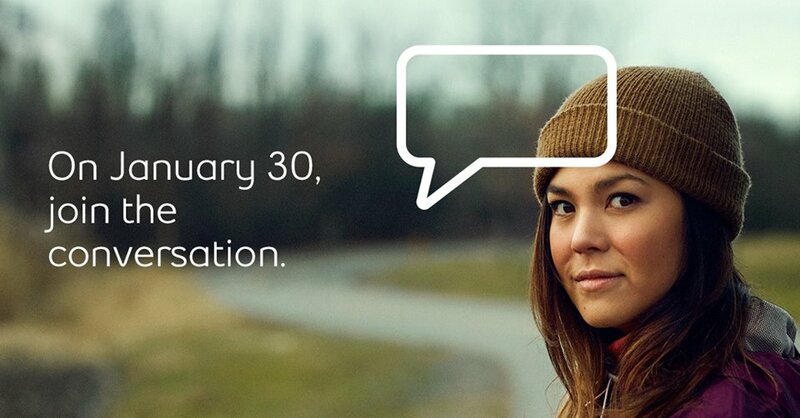 Bell Let’s Talk Day is January 30. We have mental health conversations all year long…but this day is special. Make sure you join us next Wednesday and help surpass a billion total messages of support for mental health and $100 million in total Bell funding. This past year Bell Let’s Talk Community Fund’s generous gift of $25,000 will have a life-changing impact on 100 youth across Toronto and York Region! Funding helps us provide in-depth Youth Mental Health Training to volunteer youth mentors, ages 16 to 29, giving them the confidence, knowledge and resources they need to effectively mentor youth mentees, ages 6 to 15, coping with a mental health diagnosis. Bell support will also help us to match 25 youth mentees with a mental health diagnosis with a fully trained youth peer mentor. Sometimes it’s hard to talk about mental illness. Knowing what to say or how to say it isn’t obvious. That’s part of the training we give our mentors and the impact funding from Bell Let’s Talk Community Fund has on our youth. The impact that Youth Assisting Youth will achieve through our proven Peer-To-Peer Mentoring Program is both short and long-term. Short term benefits include confidence, skills and mental health awareness for youth, an increase in the community’s capacity to support youth who are experiencing mental health issues, and a life-line for youth and families who require support with their diagnosis. The long-term impact for youth participating in the program is so much more than words! The long-term impact translates to specialized support and consistent guidance that builds resiliency, lifts youth over mental health barriers and places them on the path to success. Remember, every interaction on Bell Let’s Talk Day counts. On Bell Let’s Talk Day, Bell will donate towards mental health initiatives in Canada by contributing 5¢ for every applicable text, call, tweet, social media video view and use of their Facebook frame or Snapchat filter. Retweet or share our posts to help! It’s that easy.